One sunny day in March, 2 starred Michelin chef, Sang Hoon Degeimbre, owner and chef of L’Air Du Temps in Belgium decided to cook for us. Okay, that’s not quite true 😛 Sang Hoon Degeimbre was one of 8 internationally renown chefs chosen to cook in Crown Melbourne (for the other 7 chefs, see the end of the post). Sang Hoon took over the dominion of Number 8 Restaurant for 8 days to showcase his signature dishes (is it me, or are there a lot of eights here?). On the day that the Boy and I were there, we were excited to see him in the kitchen in action. In 2002, he met with Hervé This to learn more about molecular cooking and as they say, the rest is a gastronomical history. This one time sommelier turned head chef and owner is also one of the worlds most famous Molecular Gastronomy chefs choosing to use unconventional methods to cook, earning himself the moniker of “Father of Ultrasound Cooking”! It’s not surprising to note that before he went into the hospitality industry, Sang Hoon had dreams of becoming a pharmacist. When the Boy and I visited Number 8, we were slightly dismayed that it was fairly empty despite it being lunch hour on a Sunday. Undeterred, we were excited and were curious to see what we would be served up by someone of this calibre. We wanted to see the man who once cooked this famed dish, Le Saint-Pierre aux senteurs de Bourgogne, which simulates all the distinct notes of Pinot Noir without actually using a single drop! As I don’t eat beef, the kitchen and Sang Hoon were happy to cater to my dietary requirement and made no fuss of it. We were told that we were to have a 4 course meal which entailed a canapé, entree, main and dessert. 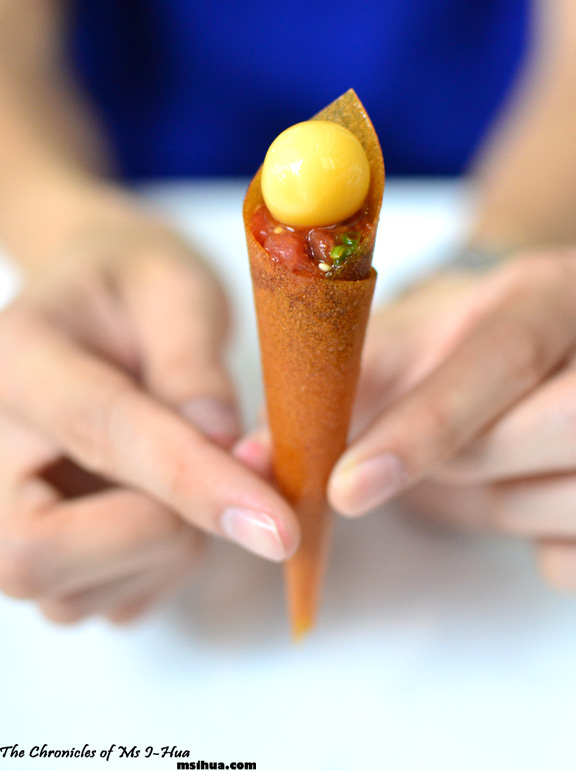 The Boy’s first course was a delicate serve of quail egg, beef tartare, sesame oil, ssamjang sauce in a cornet made from pear pastry and my first response was jealousy and my second was resentment. The Boy loved the pear pastry which was sweet and crunchy, and went absolutely well with the beef tartare as it provided a crunch factor whilst eating the soft and smooth tartare. 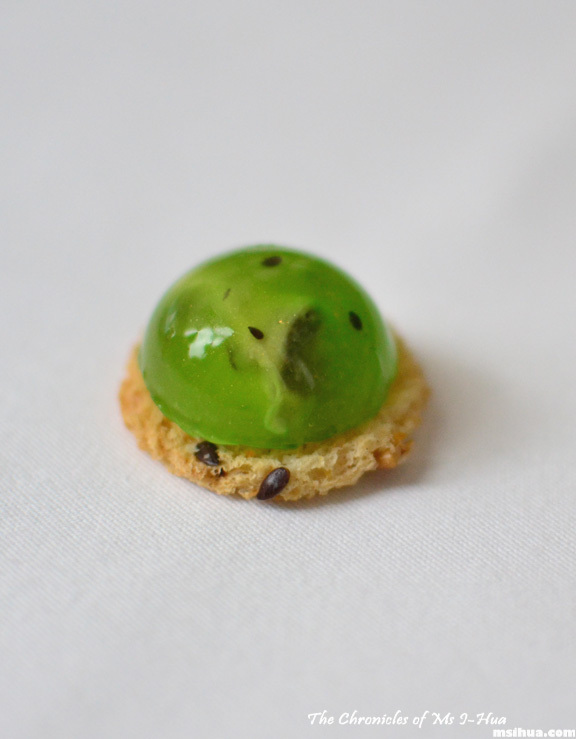 Which was just as well, as the universe answered and I was rewarded with this beautiful oyster encased in a kiwi spherification on a sesame cracker. It was a thing of marvel and beauty and this time the Boy was suffering from food envy as he was the bigger fan of molecular gastronomy. When I popped the kiwi oyster into my mouth and bit into it, I felt as if I was biting into a tidal wave of kiwi juice as it exploded in my mouth revealing the jewelled oyster encased within. Such brilliance! 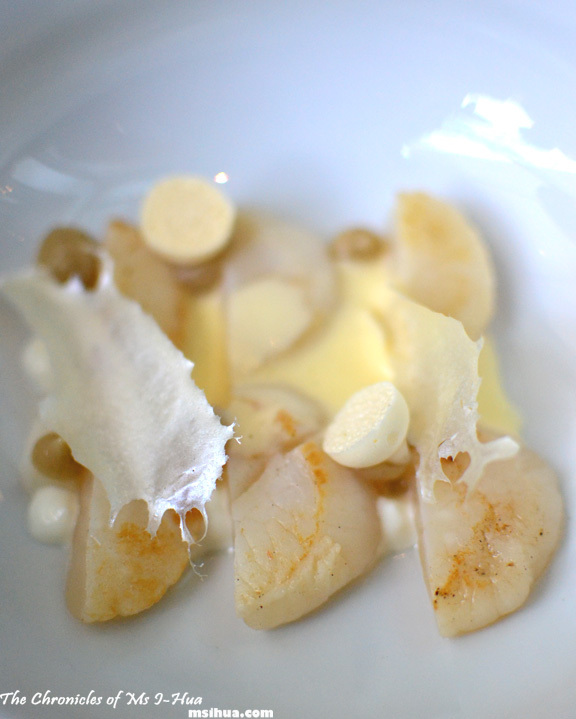 This dish came served with potato starch chips and daikon mayo. We were told that this scallop dish incorporated sous-vide to create a Korean kimchi of daikon. It was another brilliant dish with a nice balance of flavours coming from the sweetness of the scallops and sourness of the daikon and lemon meringue. Served with nasturtium leaf, finger lime, yellow zucchini, chicken broth and herbs, this dish looked simple and elegant but it certainly packed a punch in the flavours department. 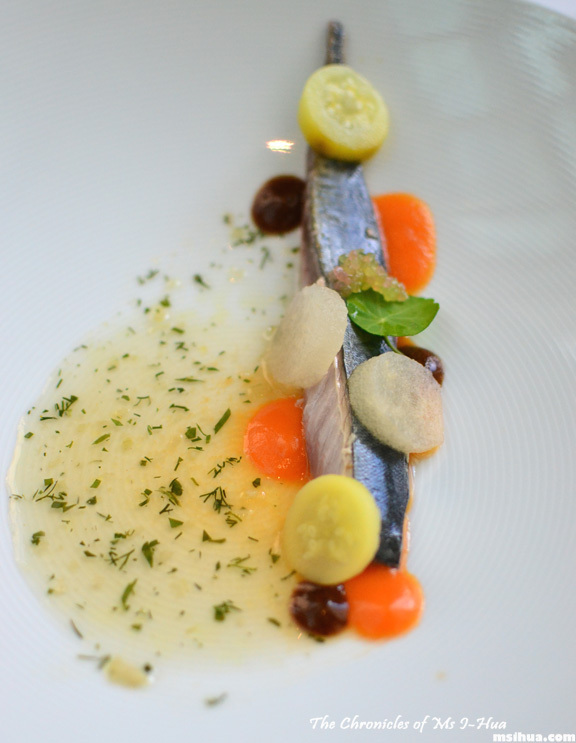 The mackerel tasted as if it was pickled which went really well with the sweetness from the black garlic puree and mellowness of the chicken broth. The use of different colours was another highlight when the dish was served to us. 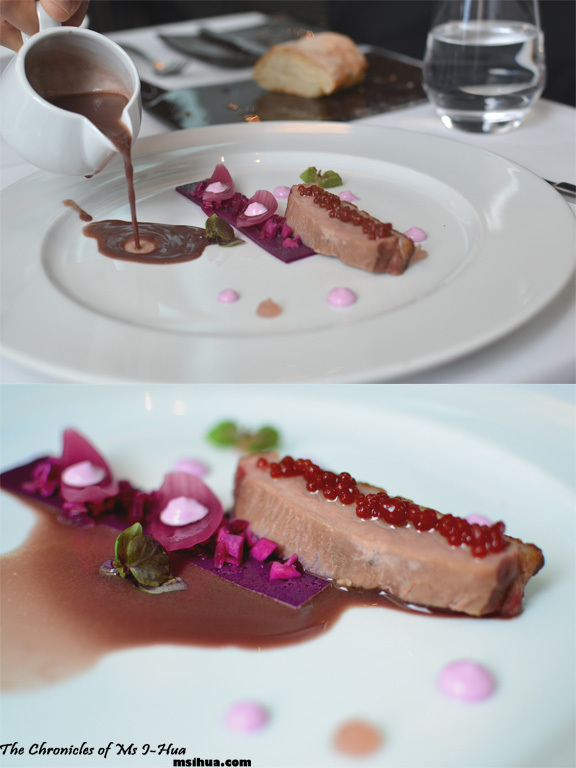 My alternate dish to beef was an ode to duck served with red cabbage sauce, red cabbage, red cabbage jelly, plum sauce caviar, onion, beetroot. I was in awe struck by how pretty everything on the plate looked but wasn’t too happy when the waiter decided to pour the red cabbage sauce messily onto my plate! Such irrational behaviour but it ruined the picture perfect dish! Luckily the red cabbage sauce was absolutely delicious. The duck was cooked beautifully as well. It was seriously an art on a plate. 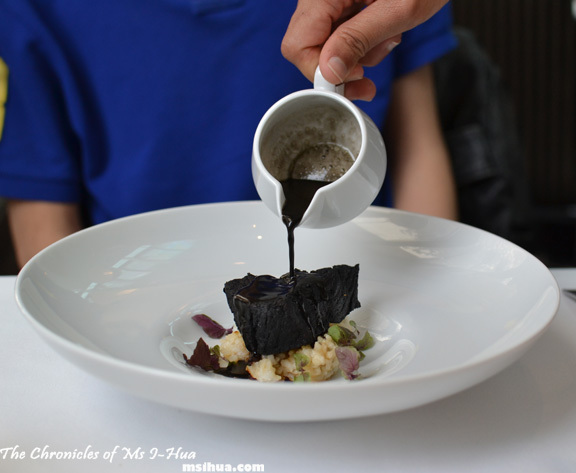 Served with a dried tuna and eggplant furikake on a bed of koshi i kari (one of the highest quality and most expensive sushi rice), it came dressed with squid ink sauce served at the table. My man was absolutely captivated and smitten with this dish and couldn’t speak as he was savouring each and every mouthful. Delicious, was the only thing he could utter. He was so taken with the fact that the wagyu looked remarkably like charcoal on the outside whilst maintaining a perfectly cooked interior. The squid ink sauce was also very palatable. He called it an ingenious dish and has not stopped talking about it until today. It has been 6 months and he still talks about it whenever the occasion presents itself. 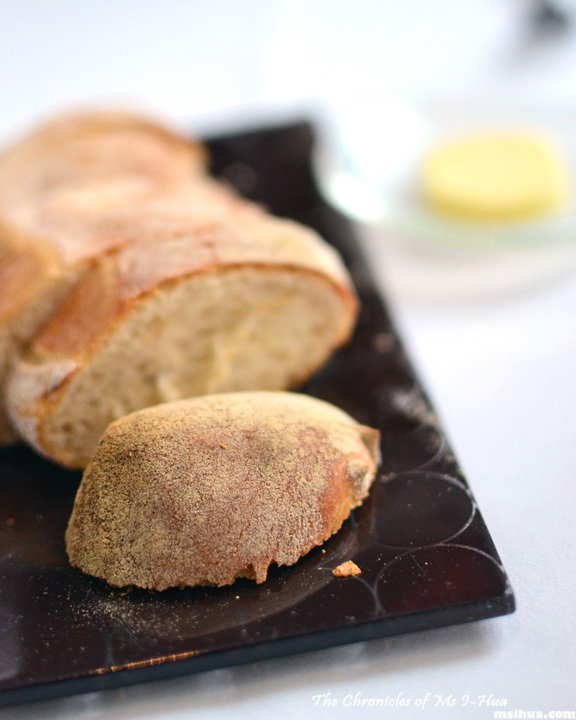 Recently, he attempted a recreation of this dish and although I assured him that it tasted fantastic, he said that it was nowhere close to the “real thing” he had on that one beautiful afternoon! All too soon dessert was served. On first impressions, we thought it was a straight up orange or mandarin dessert. 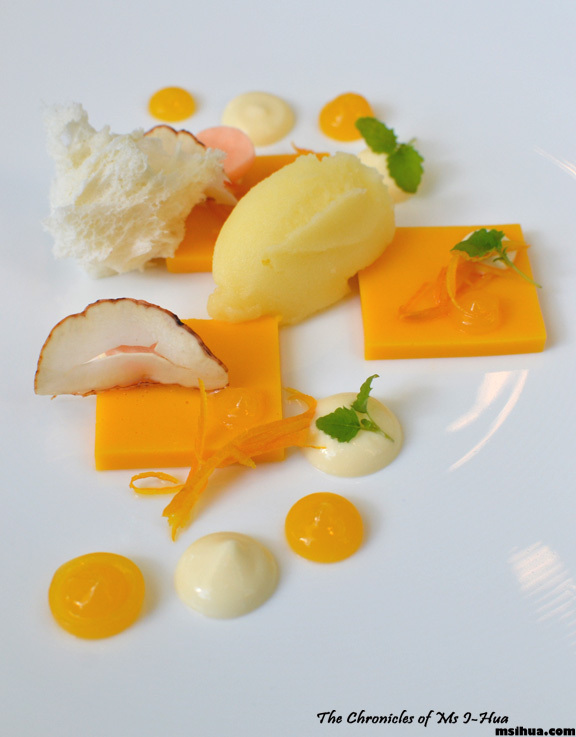 We were soon told that what we had on the plate included pumpkin jelly, mandarin sponge, cheese mousse, carrot meringue, chestnut, orange sorbet. The mandarin sponge in particular grabbed my attention on this plate as it was so light and airy, quite like eating tough cotton candy. It reminded me of the 30 second chocolate cake (using a microwave) The Boy attempted last year. I loved the incorporation of normally savoury vegetables into this dish as well and approved of the carrot and pumpkin elements of the dish. The plating was absolutely beautiful with great precision in technique worthy of Michelin standards. 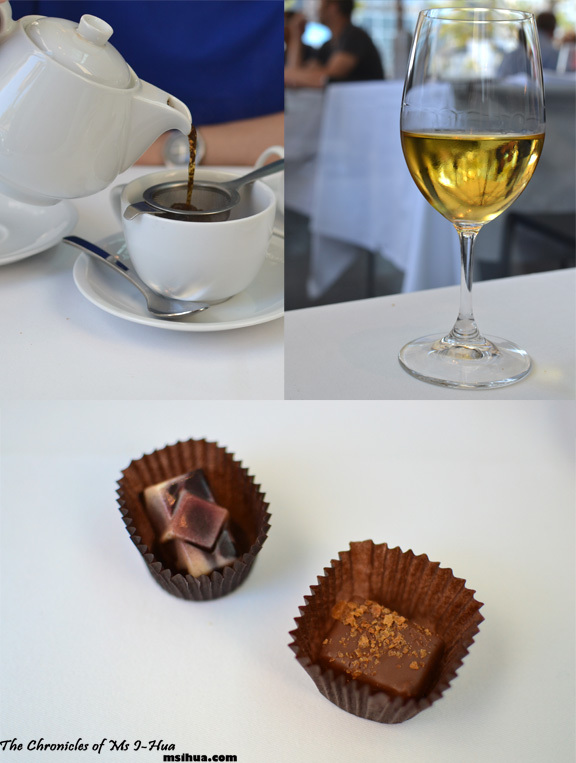 As we weren’t quite ready to leave, the Boy ordered tea whilst I enjoyed a delicious glass of sticky as I couldn’t go pass the Cloudy Bay Late Harvest Riesling 2006 (Marlborough, New Zealand) $17.50 🙂 Whilst we sipped our drinks, we were given some complimentary chocolates from the restaurant. We are always in awe of the great people of the kitchen who do it so well and so successfully and take our hats off to them. Now, to save enough money to fly over to Belgium and pay a proper visit to Sang Hoon Degeimbre’s restaurant! 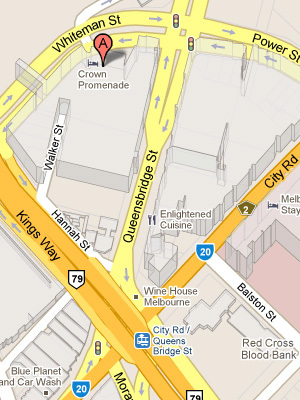 Event: Lunch by Sang Hoon Degeimbre at Crown Casino’s Number 8 Restaurant, Melbourne. Uhuh… everything was just so amazingly pretty! Yup! It’s so fun to play with! Wah. This is TOO awesome! And omg what a mouthful to say (the title I mean). You really pro at Michelin Star/Hatted awards fine dining ah. Now I can see where zeboy gets his inspirations from hehehe… But next time, can you prease invite us over when you cook like that tooooo?! I do the washing, I don’t mind LOL! You’d prob die from hunger by the time we let you eat! I know 🙁 They’ve been sloppy each time I’ve been there too! This meal looks amazing! I will like to have a taste of Belgium. Looks like a fabulous meal to please all the senses (except for sloppy sauce pouring, of course). How were the chocolates? Hahaha what does eating out and missing you have in common? Completely nothing!!! Hope you are well! 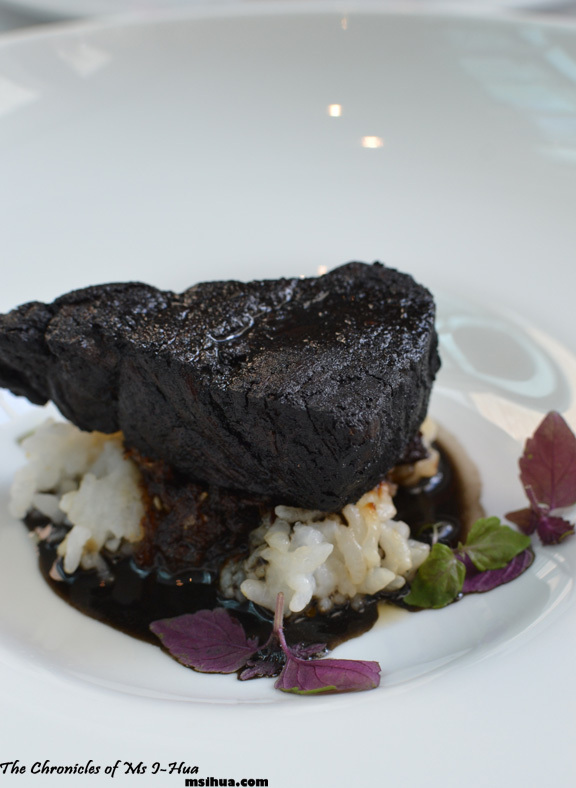 OMG wow… a Charcoal wagyu beef! I’m so ignorant that if you didn’t blog about this I wouldn’t even believe that you could eat this!!! 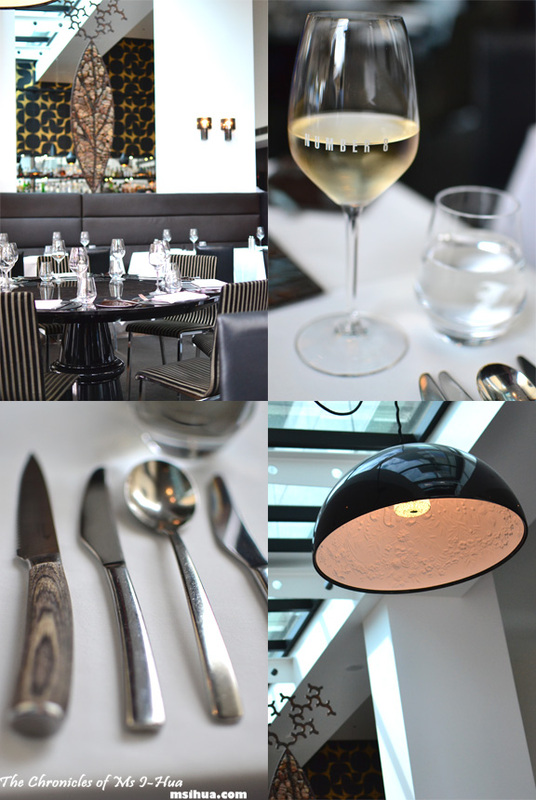 what pretty and amazing dishes! Lol.. that was Gaz’s input… to me it was lighter and fluffier! 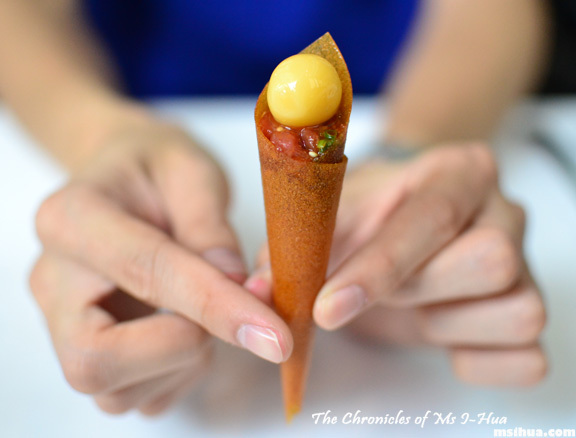 This food looks amazing and a small like an ice cream cone – so sweet! Looks like such an amazing meal. Better save your pennies to eat at his restaurant in Belgium!